It’s contagious: the promise, hope, anxiety, and anticipation a new school year brings is catching. 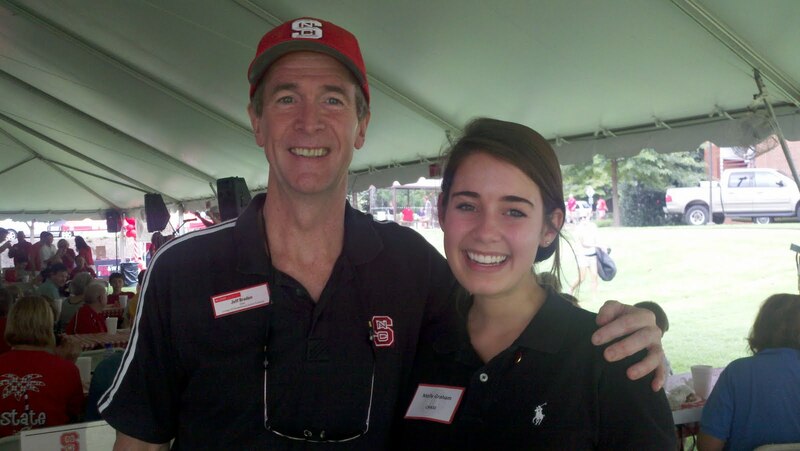 I shared some of that excitement with our new students and their parents as I helped some freshmen move into their dorms, played surrogate parent at the recent NC State Legacy Luncheon (as I did with freshman Molly Graham at left), and as I welcomed a new generation into the Wolfpack family at our Freshmen Welcome Bash last week. However, this year the feelings I have are less vicarious and more personal. My wife Jill and I are watching our youngest begin his college career. It’s funny, but I feel much more confident dispensing advice to freshmen and their families than I do to my own. It’s not that I say one thing and do another—I preach the value of the liberal arts and globalization, and our son is off to study French and Spanish at McGill in Montreal. As a dean and professor, I welcome students into a world that I influence; as a parent, I watch with a mix of helplessness and pride as my son leaves my sphere of influence. It hits home, reminding me of the incredible responsibility we accept as we welcome new students, and the trust that families and friends place in us to guide them on their journey. So what guidance do I offer to our freshmen? First, that many of the friends you make in college will last the rest of your life—so choose wisely. Some of the friends I made include Plato, Betty Friedan, Thomas Jefferson, B. F. Skinner, and Margaret Mead; there are many others, and our faculty are eager to introduce you. • What types of reinforcement are most resistant to extinction? • How does the wealth of nations influence their power in the world? • What are the fundamental principles of communication? – are known and can be shared. Someone can tell you the answer. • What is the purpose and meaning of life? • Do I believe in a higher power, and if so, how does that shape my view of the world? • What are my obligations to my family, friends, country, and the world at large—and how do I balance those with what I want for myself? – are questions whose answers cannot be given. They must be discovered, indeed, they can only be discovered, by each student. CHASS helps students with both kinds of questions. Whether they come to NC State to learn how to live a good life, or (increasingly) to earn a good living, we demand that students ask these questions. And we help them find the answers. It’s a role I relish as a professor and dean, and (I realize) one that I cannot play for my son. He is off to pose his own questions and seek his own answers, and I must be content to watch from afar. I will take solace, however, in working with my colleagues to introduce our students to those questions, to help them find the answers–and to introduce them to life-long friends along the way. Incisive, moving, beautiful article. Thanks for mentioning Betty Friedan. She's one of my heroes, with whom few of our students today are familiar. Congratulations and best of luck to your son as he begins his college career. As a French major, I know that it doesn't get any better than McGill. And Montreal is a wonderful city offering a wealth of opportunities. CHASS has an important and unique role within the university community. We are the ones who guide students to live a "questioned" life. Thanks for your support and leadership as we pursue our mission. Well done and well said, Dean Braden! Life is (among other things) a question to be explored. I can't think of a finer place to explore life than NC State. Wow–thanks. I'm honored that you took the time to read (and even better, respond) to my remarks.